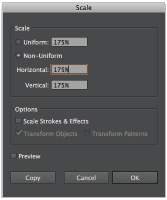 This tutorial provides you with a foundation for working with Adobe Illustrator symbols. It is the first lesson in the Adobe Illustrator CS6 Digital Classroom book. For more Adobe Illustrator training options, visit AGI’s Illustrator Classes. Symbols offers you the ability to create artwork that can be used dynamically throughout your illustration. For example, you can create a snowflake and use it over 100 times in the illustration. Every time you use the snowflake, it is referred to as an instance. If you edit the symbol, all instances are updated. Symbols can also be used to store frequently used artwork, such as logos, or clip art. In this lesson you use an existing symbol to add the retro bus to the illustration. 1 Choose Window > Symbols, the Symbols panel appears. There are only a few symbols included in the Symbols panel by default, but many more that you can access in the library. 2 Click on the panel menu in the upper-right of the Symbols panel and select Open Symbol Library > Retro. A separate panel appears with retro symbols included in it. Select Open Symbol Library from the panel menu. 3 Click on the Mini Bus symbol and drag it to the artboard. Easily navigate through all the Symbol libraries by clicking on the arrow buttons at the bottom of an open Symbol Library panel. 4 Using the Selection tool ( ), reposition the mini bus so that it is in the center of the ellipses. 5 With the bus still selected, double-click on the Scale tool () in the Tools panel. The Scale dialog box appears. 6 Type 175 in the Uniform Scale text field, and press OK. The bus is scaled to 175% of the original size. Use the Scale tool to enter an exact scale amount. If you want to visually resize the bus, you can position your cursor over any corner point in the bounding box. Click, then hold down the Shift key and drag inward or outward to scale down or up proportionally. 7 Press Ctrl+S (Windows) or Command+S (Mac OS) to save this file, keep it open for the next part of this lesson. As mentioned earlier, using symbols as clip art is an easy way to access lots of artwork, but perhaps you want to edit the symbol without affecting the original stored version. In this next lesson, you expand the mini bus so that you can recolor some of the artwork. 1 With the bus still selected, choose Object > Expand. The Expand dialog box appears. 2 Leave the options in the Expand dialog box the same and press OK. Most of the vector paths are now accessible and ready for you to edit. This has also removed any link to the original symbol.